The images on some Tarot cards can be scary, especially when they come up in your reading. It’s mostly symbolism, though -- those skeletons, devils and natural disasters should not be taken literally. 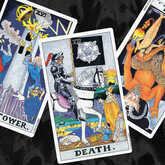 Take a look at the history and meaning of the three Tarot cards that leave most readers shaking in their metaphysical boots: the Tower, the Devil and Death cards. In a Tarot spread, the Tower Tarot card looks pretty grim. In practically all renditions of the card, disaster is striking or has just struck. The demons of madness and despair are released from ancient hiding places and nature conspires with human failings to destabilize a society. The upheaval is collective and impersonal. Let us remember, though, that these frightening images were originally created for the educated nobles and clergy, reminding them they had the most to lose if the hierarchy was toppled. Lightning is a fitting karmic payback for the guilt of those whose fortunes come from the exploitation or abuse of others. A modern subtitle might be "revolution," indicating that through drastic social change, oppressed people can find renewed hope of better times. The Tower experience comes like a flash of lightning to topple the hierarchy of the old order, after which everyone can have a fresh start on more equal footing. In a reversed position, the Tower card suggests that the drama is over. All the leaning towers have fallen. Leave behind the issues and emotions that caused this to happen. Ask yourself what you can do now that the options of your past are closed. As you pick yourself up and begin again, you’ll find renewed energy for your next significant endeavor. To look at the Tower simply, it means great change forced by those who have been made to feel powerless. On a personal level, it could mean confronting someone who is a negative influence in your life -- either causing them to change, or banishing them altogether so you can focus your energy on more positive people around you. On a collective level, it could indicate a social transformation -- like voters standing up for real change in a coming election. It’s not quite scary when you look at it like that, right? The good news is, when The Devil Tarot card pops up during a Tarot reading, it doesn’t mean the recipient is going to go to hell or will be possessed by demons. What has traditionally been known as the Devil card expresses the realm of the taboo, the culturally rejected wildness and undigested shadow side that each of us carries in our subconscious. This shadow is actually at the core of our being, which we cannot get rid of and will never succeed in taming. From its earliest versions, which portrayed a vampire-demon, this card evoked the church-fueled fear that a person could "lose their soul" to wild and passionate forces. The image which emerged in the mid-1700s gives us a more sophisticated rendition -- that of the "scapegoated Goddess," whose esoteric name is Baphomet. Volcanic reserves of passion and primal desire empower her efforts to overcome the pressure of stereotyped roles and experience true freedom of soul. As a part of the message of Tarot, this fearsome passion and power must be reintegrated into the personality to fuel the soul’s passage from mortal to immortal. The Devil card in a reversed position suggests that you are enjoying creating chaos and resistance for no particular reason. Your sense of humor could be a bit twisted. Your motive may be vengeance or you are simply being an irritant. The juvenile prankster streak in you must be corralled and changed before it gets you into further trouble. Suppress those impulses until you successfully engineer a shift away from this careless behavior. Such antics will cost you in the long run even though they seem amusing in the moment. Basically, the Devil card tells us what impulses we need to accept as part of our basic nature, what Sigmund Freud called the "Id." We can only suppress it so far, but we can suppress it enough that it doesn’t translate into addiction or destructive behavior. It’s knowing who we are and our own limitations. A resolution that’s much better than an eternity burning in hell, certainly. No card in the Tarot deck is as feared -- and as misunderstood -- as The Death Tarot card. What has traditionally been known as the Death card is not about literal death of any person. It may represent the death of something else, like a project, plan or relationship. It also points to a time of harvest, symbolized in classical decks by the reaping skeleton. Unless the fruits of summer are harvested, they are lost to winter’s harshness and the people do not eat. This card portrays the action of winter on the landscape -- lush greenery is cut back, revealing the bones of the landscape. The season of dark and cold separates the annual plants -- that live and die in one year -- from the perennials, which can take refuge in their root systems until the following spring, to sprout anew. As the scythe cuts the cords that link us to the past, it liberates us to go forward without fear, because we have nothing left to lose. We can see that everything pruned away is recycled for the fertility of the future, so that nothing is really ever lost, despite seasonal cycles of gain and loss. In the more modern decks, we see Death mounted on a horse and wearing black armor. The emphasis in these decks is on the punishment of sin -- much like the way the medieval plague, which inspired the death image, was used to explain the wrath of God. Luckily, nowadays, we aren’t so encumbered with such a guilt-ridden philosophy. The Death card reversed suggests that you might long for the cord to be cut, but unfortunately you have to persist and endure without the relief of an ending. It is not time for termination and closure yet. Be patient with the current circumstances without resigning yourself to a negative outcome. Coming changes may alter the way you feel about the status quo. Remember that harvest isn’t started until the fruit is ripe. Work at becoming wiser and mellower, sweeter and more nourishing, and your time of release may happen sooner than you think. 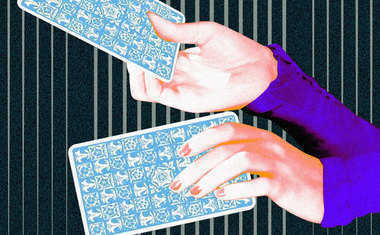 Discover Your Zodiac Sign's Tarot Card!